Also serving communities of Sisters, Madras, Warm Springs. The average cost of assisted living in Redmond is $3,895 per month. This is higher than the national median of $3,346. Cheaper nearby regions include Bend with an average starting cost of $3,045. To help you with your search, browse the 13 reviews below for assisted living facilities in Redmond. On average, consumers rate assisted living in Redmond 3.9 out of 5 stars. Better rated regions include Bend with an average rating of 4.1 out of 5 stars. Redmond, located on the eastern side of Oregon's Cascade mountain range, is home to more than 26,000 residents. The city offers a host of museums for seniors to enjoy, including the Redmond Historical Society Museum, located in an historic downtown storefront. Seniors can also select from are seven assisted living facilities in and around the City of Redmond. These facilities are regulated and licensed by the Oregon Department of Human Services. Redmond has an array of community resources for seniors, including the Central Oregon Council on Aging, a facility that offers meals, nutrition services and transportation for residents age 60 and older. While the cost of living in Redmond is less than in many other parts of Oregon, It is still a relatively expensive place to live. The overall cost of living in Redmond is 13 percent higher than the national average, with items in all categories, except for utilities, costing more than average. This can quickly erode a fixed income. Redmond's climate is categorized as "steppe" or high desert, depending on the scale. This means that Redmond has a short growing season with warm days and cool nights. Redmond also gets quite a bit of snow, an average of 24 inches annually. The average high temperature in Redmond in January is 42 degrees Fahrenheit, and the average high temperature in July is 86 degrees Fahrenheit. This type of climate might pose few challenges for seniors. Although the overall crime rate in Redmond has increased by 6 percent in recent years, crime is still not the problem here as it is in many other Oregon cities. Redmond is safer than 42 percent of other U.S. cities. Driving around Redmond is easy, given the town's relatively small size. U.S. 97 passes through the center of town and connects Redmond with Bend, Oregon to the south. For public transportation, Cascades East Transit operates a fixed-route bus service within Redmond and between Redmond and Bend. Seniors age 60 and older pay half-price fares. The Redmond, Oregon area is home to world-class medical facilities including St. Charles Health System Redmond, in the event of medical emergencies or illness. Assisted Living costs in Redmond start around $3,895 per month on average, while the nationwide average cost of assisted living is $4,000 per month, according to the latest figures from Genworth’s Cost of Care Survey. 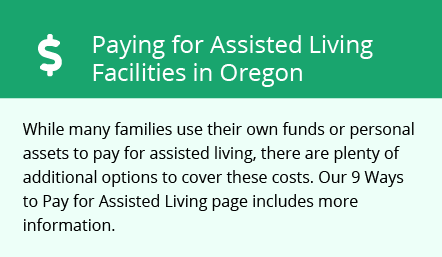 The State of Oregon and the U.S. government offer a number of programs to help make ALFs more affordable for Redmond seniors. These include Community First Choice Plan (Oregon's K Plan) and Supplemental Security Income Category G.
To see a list of free assisted living resources in Redmond, please visit our Assisted Living in Oregon page. Redmond-area assisted living communities must adhere to the comprehensive set of state laws and regulations that all assisted living communities in Oregon are required to follow. Visit our Assisted Living in Oregon page for more information about these laws.